In the midst of all the important things happening in my life, don’t blink or you’ll miss them, one is in neon lights. That would be Christmas lunch. Not to be confused with when the G.O. a few years back, in competition with our over the road neighbour draped the front verandah in neon chaser lights in an attempt to be Christmas Lights King of Taylors Arm but succeeded only in creating a display resembling a truck stop. You’d think after 46 Christmases: good, bad and indifferent, I’d be less avid. If I’m honest, I approach Christmas with the best of intentions but mixed emotions. I prefer Christmas to be just so. In reality, it rarely gets close. I enjoy Christmas. So long as it’s not competitive and will never qualify as an Olympic Christmas event. Underpinning the emotions is the knowledge that whatever I do, it’s for me, for my own amusement. I have to keep returning to that. Am I a Christmas turkey? Like so many families, mine now have diverse commitments on Christmas day. Since my grandparents died when I was little, the entire family has spent one Christmas day together, at my house way back in the 80’s. Many of them travelled from away and stayed for a few days so it had the coming together feel of the old days. It was lovely. It was particularly lovely because even though I’d spent a month cleaning, my aunts just cleaned and cleaned… We went to our family church [tempting to joke about nips of scotch beforehand and cracks in foundations…], and afterwards had an all hands on deck Christmas lunch which by virtue of air conditioning was the last hot Christmas lunch I’ve prepared or eaten. My Dad is not a good gauge, being at the lower end of jolly season barometer of family Christmas sentiments, having once opined “it’s just another feed”. We care but being a cool, calm, considerate and expanding family we ease the burden of Christmas commitments by getting together at other times to do other things, and touch base on Christmas day by phone. Currently the G.O. and I are Taylors Arm centric at Christmas. It heralds the start of our annual summer holiday, and by virtue of her vintage the M.I.L who lives nearby in town gets first consideration. Formerly we’ve hosted a simple festive lunch affair, attendees comprised of the M.I.L, her husband, the G.O. and me. Three years ago my S.I.L. and her husband moved back to share the house in town, and two years of government bonus payments meant they felt they could afford to host Christmas lunches. Fair enough. We made our contribution, and reaped the payoff in having to do little in the way of prep and cleaning up. This year we broached the subject and were bluntly informed “it’s your turn” and “if you’re putting it on, we’re coming”. Okay. And here lies my dilemma. The one I mentioned. I prefer Christmas to be just so. Whatever I do, it’s for my own amusement. Last year we went to the local Taylors Arm church as it had recently resumed services. It’s a big old white timber building that commands the top of the hill one house up from us. Despite its Catholic denomination all are welcome, and Father Michael, a fun, relaxed surfie priest comperes an inspiring observance. This year we’re attending again, so our guests unless they change their minds and come along will have to amuse themselves until we arrive home. Before we walk up the hill we’ll do what we always done: set the table with a good white bed sheet in lieu of a tablecloth, beaded silver placemats, my much loved mismatched floral crockery plates, a table wreath I’ve had for 20 years, jars with flowers from the garden, festive Christmas crackers, all covered with the silver edged throw-over. When we return, out will come the Christmas CDs who’s airing the G.O. can only abide on 24th & 25th December. I’ll open a bottle of sparkling wine to accompany the assembly of components for the festive repast: a selection of fresh cold food I sourced or prepared in forgoing days, and accommodate the guests’ desire for an early lunch. Prawn cocktails. This is new. The M.I.L. hates peeling prawns, so this year we’ll save everyone the effort and peel a few extra on Christmas Eve after we’ve had our seafood supper. Small roasted chickens with bread stuffing. 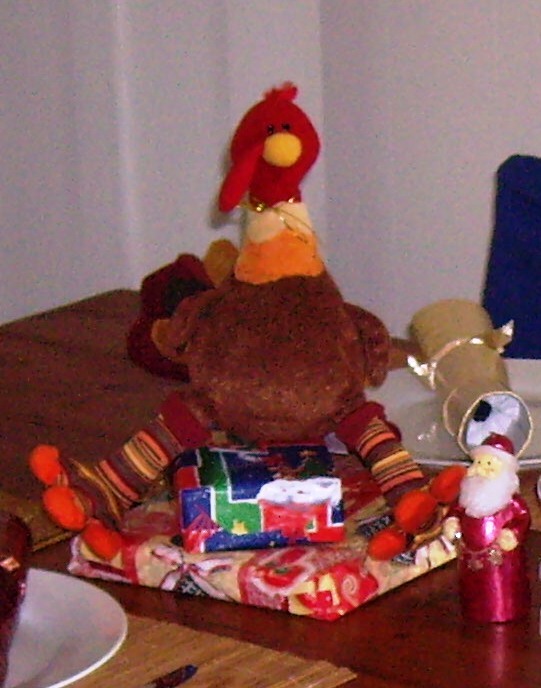 The chickens’ true purpose is to function as a carrier for the stuffing plus a leg for those so inclined to gnaw on, and leftovers. We did cook a turkey once, on a 40 degree Celsius plus day in a too-small barbeque. The result resembled an oversized Portuguese BBQ chicken but tasted good. Ordinary potato salad made with mayo, cream, boiled eggs, peas and shallots, and maybe capers if I’m feeling adventurous. Potato bake at the request of the guests. Tossed salad of whatever good greens I can find and home gown tomatoes, I hope. Deconstructed trifle. This also is new. The G.O. is not a fan of traditional trifle. I’m not a fan of carton custard and tinned pudding usually proffered and preferred by our guests, or of over-soaked trifle. While the oven is warm from the chooks, I’ll bake custard and dozen or so Madeleines, make room in the fridge for jelly, and poach a punnet of raspberries in vodka and sugar. As soon as the main meal has been consumed the guests will be anticipating dessert. Once the plates are cleared, I’ll make a round of coffee and tea, and assemble the elements with a drop of good cream, and crossed fingers. Our guests, after a post lunch stroll around the garden and verandah, a wander through the house, and possibly a brief respite on the futon or sun lounge, will depart to their own domicile for a traditional post Christmas nap. By the time they arrive back in town, the G.O. and I will have washed up and retired as well… a fitting end to a Christmas just so. * Bella figura loosely translated: presenting yourself to world in the best way you can. This entry was posted in Blog and tagged Australia, Christmas, cooking, food, my life. you know you cant win this one elladee … they will not change their point of view no matter what you do! some things are just irrevocable … if someone does all the christmas dinner work then it has to be stated to be “too much trouble” or one is losing face, or not being impressed enough …. culture wars .. no way around it! it brought to mind an afternoon that troubled me for ages, when a group of study colleagues met at our place, and one spent about an hour cleaning my egg beaters … years later I asked her about it, and she laughed, saying it is the only way she can relax and enjoy herself in company, she has to find something to do! I’m not religious, but the way it has become so commercialised, shops decked out with Christmas decor and gifts by the end of October, everyone trying to out do each other with expensive gifts and going ino debt in the process. I could quite easily hibernate from November till January. Rather you than me. And I would need more than one bottle of sparkling wine, let alone sharing it with guests. We chucked the family christmases years ago. We told both sets of in-laws that we weren’t prepared to choose between them (at other ends of the country) so we wouldn’t be visiting either. Nor did we ever again. Bliss I tell you. Sheer bliss. The sparkling gets me in the festive mood – no-one else drinks it, but a glass or 2 at lunch time, usually in the warm weather means I’m really looking forward to that nanna nap after the washing up’s done. It’s only now we are near the M.I.L. that Christmases have any structure, it was a hit and miss affair before and sometimes yes, the bliss of a solitary event 🙂 I agree re the vege option. Ham, chicken… big deal, not. I can’t believe you are planning it already, haha, looks like it will be just us for Christmas. I love Christmas, but I am the only one that feels that way about it. I hope it all comes off for you EllaDee. Your peaceful christmas sounds like bliss. The influx of visitors sounds blah…. Funny how we always end up wishing for the peaceful one but getting the busy one isn’t it. Between us the Man and I have few family members yet we have managed to avoid the responsibility of The Meal for many years. That’s what we get for being the ones who live furthest away, nobody can be bothered coming here and then going on to the next family event. Yay for us! We actually moved out here to get away from people, it has worked quite well 🙂 I’m with you, stay away from the house in town. We would move further out if we could. Oh, Ella, what a predicament! I have experienced first hand the dissapointment and sense of failure after trying to reroute my family. Growing up without any sort of religious background, I enjoyed a very traditional Christmas, including: presents, a Christmas breakfast, and then playing with aforementioned presents. Things changed as I grew into who I am now. Now, being one of who follows Christ, my opinion on Christmas will likely differ vastly from those retaining liberal views on the holidays. While I still employ a hearty belief in surprising loved ones with special gifts, Christmas day has grown into less of a party and more of a celebration of Christ’s birth. Last year, instead of doing what we normally do open $$$ worth of presents and eat, we spent the morning at a shelter, feeding 400 homeless. It was daunting at first, and challenged me to be sure, forcing me to step outside my comfort zone; but I admit that, after the fact, I realized how blessed “I” was by spending the morning with them. I hope to do that again next year. So . . . I say, if they’ve left the choice up to you, do as you wish — if you can disentangle yourself from your and your family’s expectations, then there is no harm in making a feast for all to enjoy. Or if it appeases you and your spouse, order a pizza. 😉 Above all else, being together is what should matter. Thank you. It’s interesting to hear the different ways people approach and spend Christmas Day. I think the idea of volunteering at a shelter and spreading festive cheer, and food, where it is much needed is a wonderful thing to do. At the moment our Christmas Day rituals make us happy, and it’s important for the G.O. to spend the time with his family [even though they insist we go to too much trouble ;)] My family take care of themselves thank goodness. Ah the beauty of the holiday season. 😉 Only the kids get to really enjoy it.